Historic New England staff are cleaning, photographing, and updating catalogue records for historic objects while we upgrade collections storage in Haverhill, Massachusetts, and sharing updates along the way. Our latest post is from Peggy Wishart, Americana Foundation assistant registrar for the Collections Care Project. Contrary to popular nineteenth-century narratives (think James Fenimore Cooper’s The Last of the Mohicans), indigenous people did not disappear from New England. By the late nineteenth century, Native New Englanders adapted to increasing population pressure and the ensuing changes to their seasonal travel patterns. Some extended their traditional skills into the mainstream economy by making and selling baskets. These two wood splint baskets from the Historic New England collection are examples of Native American culture in the Northeast. The first is a round blue and green storage basket made around 1840. The second is a small red sewing or trinket basket made in 1930. Both are beautifully made using natural and colored ash wood splints. 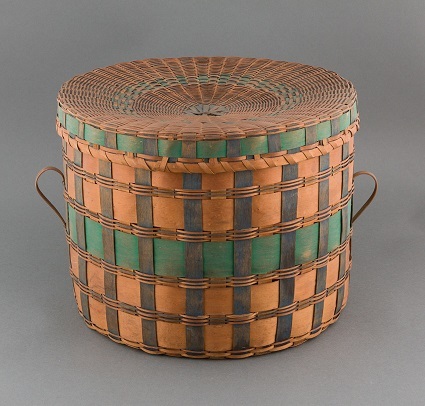 The blue, green, and natural-colored splint storage basket was probably made by a Penobscot basket maker. Penobscot territory is a wide area in central Maine associated with the Penobscot River basin. The basket’s base is marked with the name of the owner, a member of the Fowler family of Massachusetts, and the date 1840. Native American basket makers of this era spent intense periods of time making baskets, then traveled on foot peddling them, often in summer. This pattern somewhat mimicked the seasonal movements of their ancestors. The second basket is woven from narrow pink and natural-colored wood splints and braids of sweetgrass. The basket is marked on the bottom with an illegible name – probably the maker’s – and the date December 6, 1930. 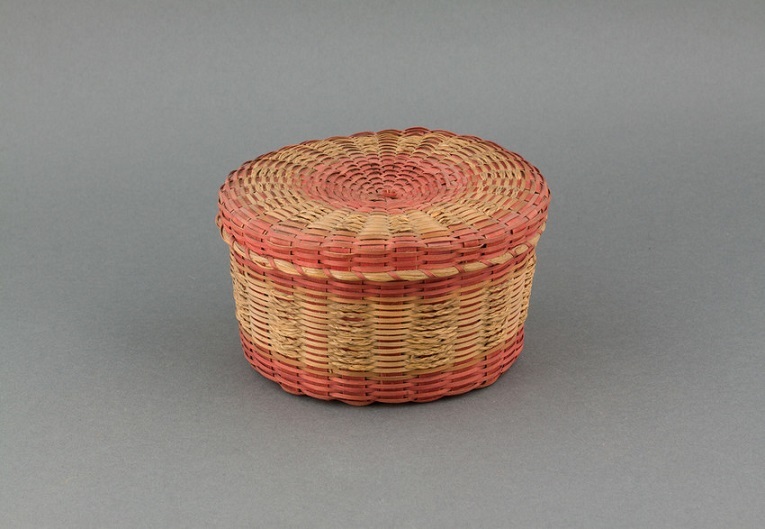 Bright pink was a popular color for small splint and sweetgrass baskets in the 1920s and ’30s, often made using commercial dyes. Its exact place of manufacture is unknown but it is very similar to many baskets sold by Native Americans from roadside stands and at tourist attractions in northern New England during the early-to-mid twentieth century. Native American basket makers took advantage of the rise of tourism and the automobile, setting up roadside stands to sell their wares. Baskets like this one were so prevalent that they are often found in antique shops today. My mother kept jewelry in one on her bureau for many years. It was purchased by my grandparents, probably in the 1950s, on one of their many summer road trips from their home in Massachusetts to visit family in Nova Scotia. Many of Historic New England’s Native-made baskets were acquired the same way, purchased as souvenirs or to store household goods. They are part of a large constellation of Native-made objects that appeared in New England homes from the eighteenth century to the present day. To help us preserve important New England objects such as these baskets, please consider a donation to the Collections and Conservation Fund.